I won't go so far as to say that I love working out, but when really great music is playing I can get into a workout state of mind. I've been spinning about 3 times a week and for the most part the instructors have really great songs, but for me, if the music is lacking I wont push myself as hard. I thought it would be fun to create my own mix that would be great for any cardio activity! Some are newer songs thanks to iTunes radio & other's are just pump you up songs! Shape of You & Taped Up Heart are my current favorite songs - I have them on replay constantly! Perfect playlist! I cannot get enough of that new Ed Sheeran sing and I a,ways gig to have a Gaga tune on my lists! Can't wait to see her in the Super Bowl!! Have a GREAT day!! I don't have any long sleeve work out tees - that one is super cute and I love the fun little cut out in the back! I am always looking for new songs to pump me up. Thanks for the recos!! How cute is that UR gym bag, great picks! I can't say I am working out that much, unless you include chasing four kids. BUT! I love this mix, and I cannot wait for the whole Ed Sheeran album to come out....obsessed!! My cardio game is definitely upped with good music.... but usually I watch tv on the treadmill instead lol. Great legging selection. Music is definitely motivates my workouts! This is a great playlist! Thank you for sharing it! I can't stop playing Ed Sheeran's new song either! So good! This list is so good! I'm in desperate need of new workout songs! I am literally listening to music that's been on my ipod since 2013 haha! Love the workout picks too -- the pink top with the cut out detail in the back is so cute. Thanks for the suggestions! I always feel like I need good workout songs or I just give up! Loving this playlist so much! You totally have some goodies on this list! Also love the workout picks so chic! When I'm working out at home I HAVE to have good music playing! It definitely helps me push myself!! You know I love posts like this! I have a new running mix brewing that is almost done. Ohhhh you can buy from TJMaxx online now? That is fantastic news. I'm always looking for new songs to add to my workout playlists. I agree, if studio classes don't have great music, I'm just not into them. Thanks for sharing girl! I looove that Gaga song and Sia too!! That play list is awesome and definitely a great one for a great workout! I'm definitely looking for more songs to add to my cardio playlist so I'll be adding so many of these! Also LOVE all the gear you picked--those purple leggings are too cute! Such a great mix! Thank goodness Pure Barre plays great playlists otherwise, I would be struggling! Perfectly timed post! I was in the mood for some new music to run to and I think some of these songs would make great additions to my playlist. Love this! Looking to update my playlist asap! It's amazing what a good playlist can do to motivate you. I am trying to get back my workout grove that I had before I got pregnant. I mean, let's face it...I totally phoned in most of my workouts while pregnant and I haven't worked out since maybe October? It is so hard to get back! I think I am going to go download your playlist and treat myself to a few new pieces of workout gear to get inspired again! Lol, I couldn't help but think of Arielle Charnas from Something Navy's daughter, Ruby Lou, when I saw the first song. If you watch her IG Stories, that's Ruby's favorite song and she's always jamming out to it, haha, such a great beat! You've really created an awesome playlist here that'll sure to get you pumped and ready to push yourself further. I'm the same way. Cardio is not my fave, but if there's a great music line-up, I get in the zone, haha. Thanks for sharing, beauty, and I hope you're having the best week so far! That's a good mix! Good music is essential for me if I'm working out in the gym or on my own without a video. A good playlist makes all the difference for a workout!! i use my s'well bottle every single day too. my boss is constantly saying "you ALWAYS have that thing." Um yes. Shape of you is definitely my favorite song right now too! So catchy! I got my husband a swell water bottle for his birthday a couple of years ago and he left it in a room after a meeting and someone took it-- so sad! I'm always on the hunt for new music. Nice! That gold water bottle!!!!!!!! Heart emoji eyes popping out. I'm obsessed with Ed sheeran !! Love this! Great playlist! I've been needing to update my workout tunes so this is perfect. And I love your workout gear picks! totally agree about the music in classes - i've been doing spin for the last couple of weeks and some of the music is so fabulous and other songs are... eh. haha. there is one song that goes with a specific lunge track in body pump that i added to my own playlist because i just love it for any workout - it's called peanut butter jelly. hahaha. it always pumps me up. i need new workout clothes and i've asked for them for my birthday - i'll have to share some of those links with KC! I am with you - I definitely need good music to get me through a workout - I always just listen to Pandora but I really need to take this as some inspiration to get around to making a playlist! I listen to a lot of Spotify for cardio, but I get bored of it too...I am totally stealing this! I'm obsessed with "Shape of You"... such a good song!! Great list!! I have some new ideas now to add to mine! I'm kind of weird with workouts, but I don't always listen to really high-intensity music...like, sometimes I can workout in the gym for an hour or go for a run while listening to some more mellow singer/songwriter music. I'm LOVING Brandi Carlile right now... And The Shins are one of my all-time favorite bands..their albums are great to listen to straight through! I am completely obsessed with Shape of You. Ed Sheeran is always just amazing! And I love my gold Swell bottle, too! It's unbelievable how long the water stays cold in it! You're so right about the right music can make or break a work out, so hopefully the spin classes get some better music sometime soon! Swell bottles really are totally worth it! I don't know what I'd do without mine! LOVE this playlist, B! Really and truly a lot of Gaga's and Sia's music is great! I often listen to the workout stations on Spotify because they are SO good! I am always looking for new songs to download so thanks for sharing girl!! Chris got me a S'well bottle for Christmas and I love it. :-) Hope that your day has been great too!! Great playlist. It's so important to have a good playlist ready for workout, it's so motivating. I agree the music sets the pace of your workout and really upbeat songs help to pump you up when it comes to extreme cardio. Of course comfortable workout tights and a sports bra are a must too! Ive been looking for some new tunes! I need to check these out! I love Applause by Gaga! Awesome playlist and I love those rosy pink Nordstrom tights! I'm obsessed with making playlists for when I'm being active, so I can't wait to check this one out. Great roundup, too! I'm heading out early, so happy weekend!! Chase You Down is my JAM. Seriously what a tuuuuuune! I love this playlist, lady- thanks for sharing! LOVE this playlist, I'm going to add it to my phone. Applause is one of my favorites to get me through to the end of my treadmill circuit! Love this playlist! Love that Ed Sheeran song right now too! I'm obsessed with Shape of You by Ed Sheeran too!! 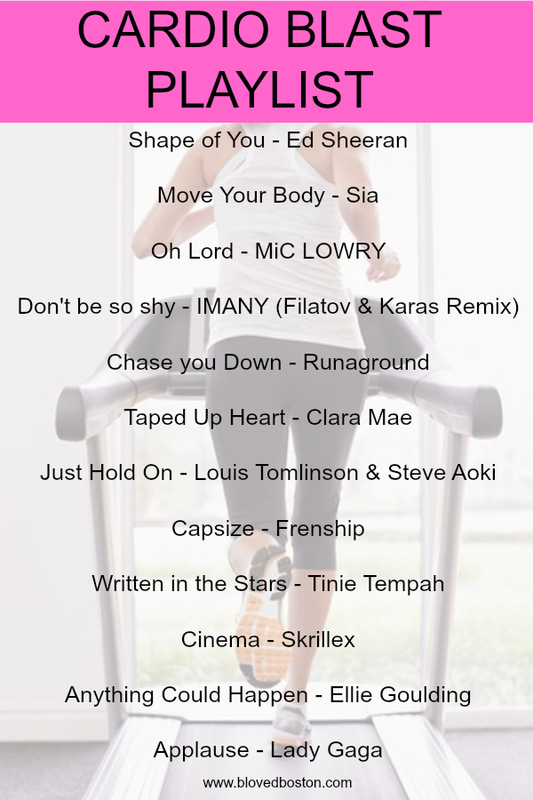 This is such a great cardio playlist! That's some awesome workout gear! I work out at home, but if I left my house I would for sure be sporting some of that stuff! I love working out to that Sia song! Such a great list!